Home > Orders > Military Order "For Bravery"
Ribbon: Sky-blue in colour with a silvery stripe near both edges. 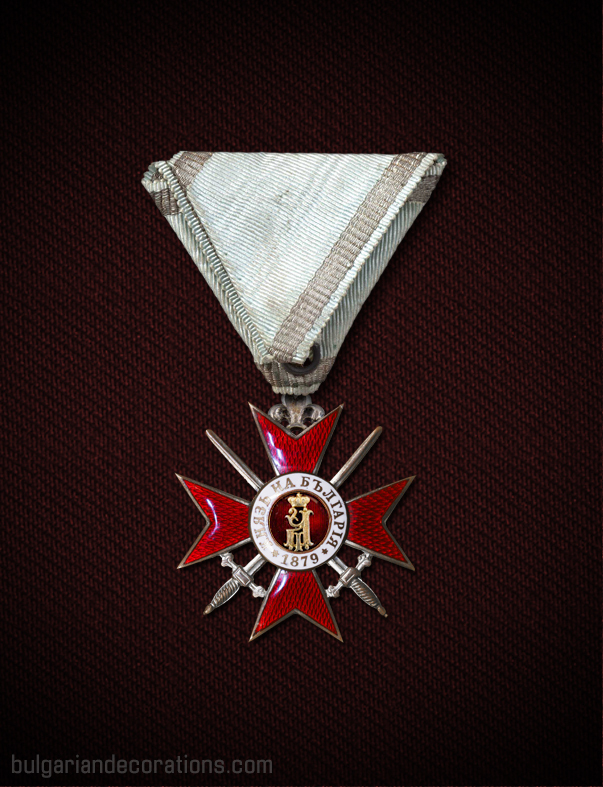 Obverse: White or red enamelled Maltese cross with circular centre. In the centre of the badge is depicted a gilded lion rampant on a dark red enamelled background. On the outer ring (which can be either gilded or enamelled) is inscribed “ЗА ХРАБРОСТЬ“ / translation: for bravery / and either (1) seven decorative elements, (2) the year “1915” or (3) “1941”, depending on the issue. Reverse: White or red enamelled Maltese cross with circular centre. In the centre of the badge is depicted a gilded crowned founder's royal cypher on a dark red enamelled background. On the outer ring (which can be either gilded or enamelled) is inscribed “КНЯЗЬ НА БЪЛГАРIЯ“ (or “КНЯЗЬ НА БЪЛГАРИЯ“ on later issues) / translation: Knyaz (Prince) of Bulgaria / and the year 1879, separated via two stars (or dots). 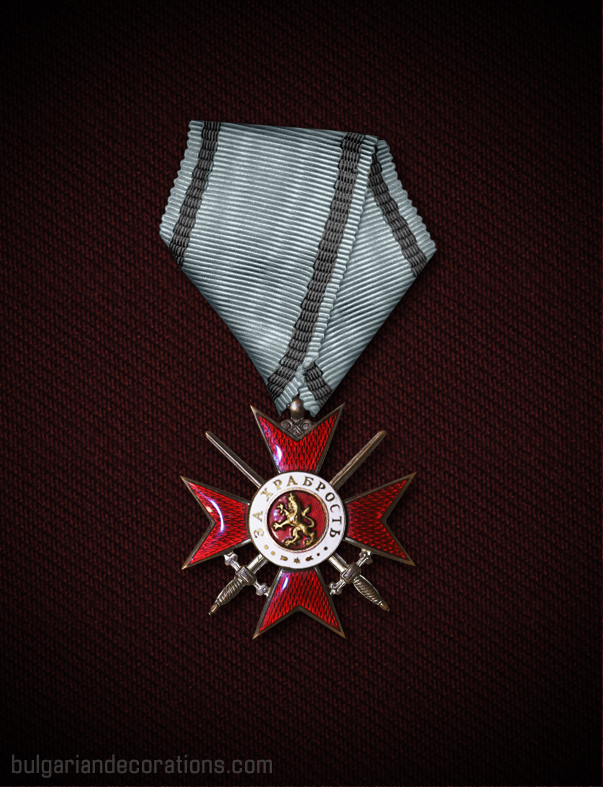 Associated decorations: Soldier's Cross of the Military Order "For Bravery"
The Military Order "For Bravery" is the oldest and most recognisable order in the history of the Third Bulgarian Kingdom. Its history begins in 1879 when the first Constitution of the Bulgarian Principality has been passed by the National Parliament in Tarnovo. Under clause 58 of this new highest document, it is stated that within the borders of the newly established state, ‘…no noble titles and orders of distinction may exist of any sort’. 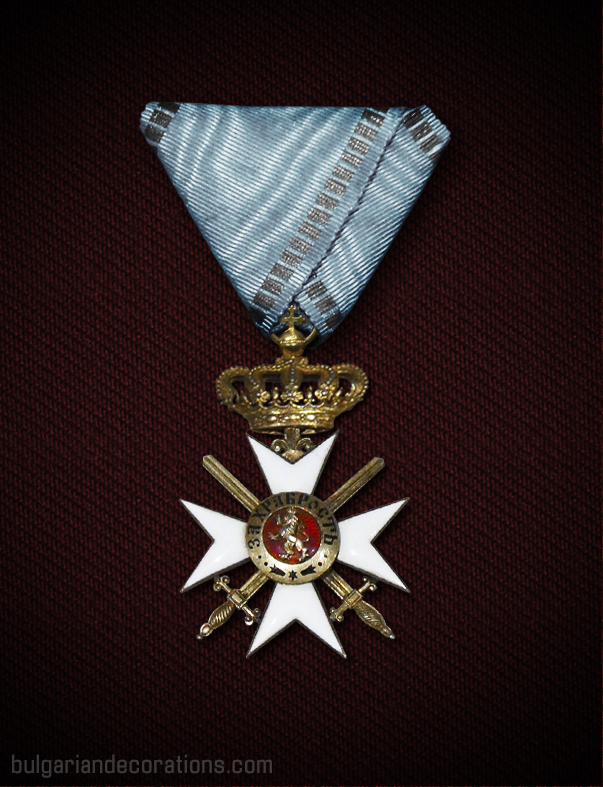 However, the next clause makes an exception by allowing the new Monarch to establish ‘a single decoration for military distinction in wartime and only for army men’. This clause makes it possible for the Military order to be established on 1st January 1880 as the nation’s only official order which is being awarded for exceptional military deeds and demonstrated valour on the battlefield. 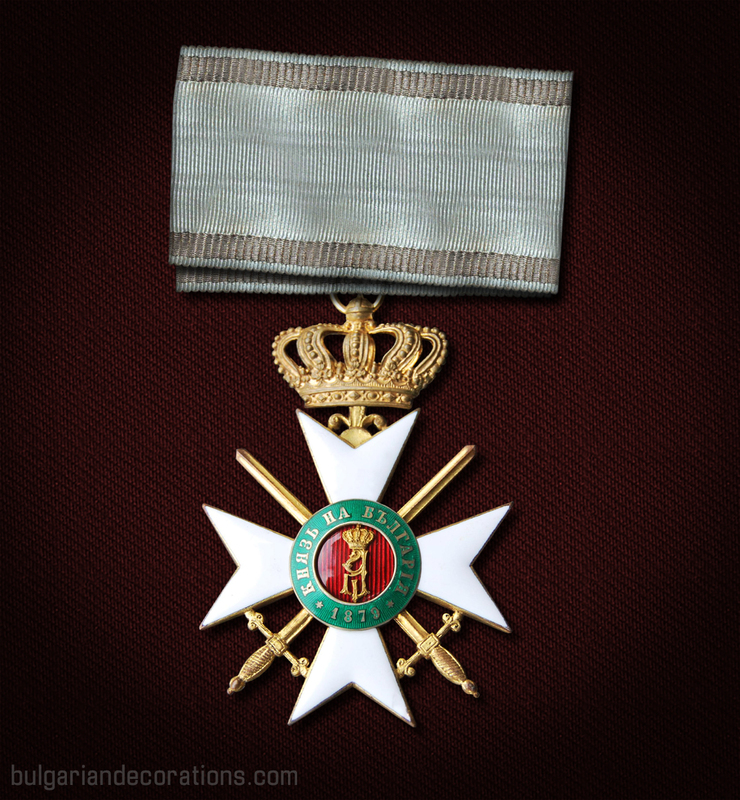 The official establishment of the order took place on the first day of 1880 when a Royal decree has been issued, stating that a military award has been introduced in four classes for army officers and generals, and two classes (which become three later that year) for enlisted men, NCOs and officer-candidates. 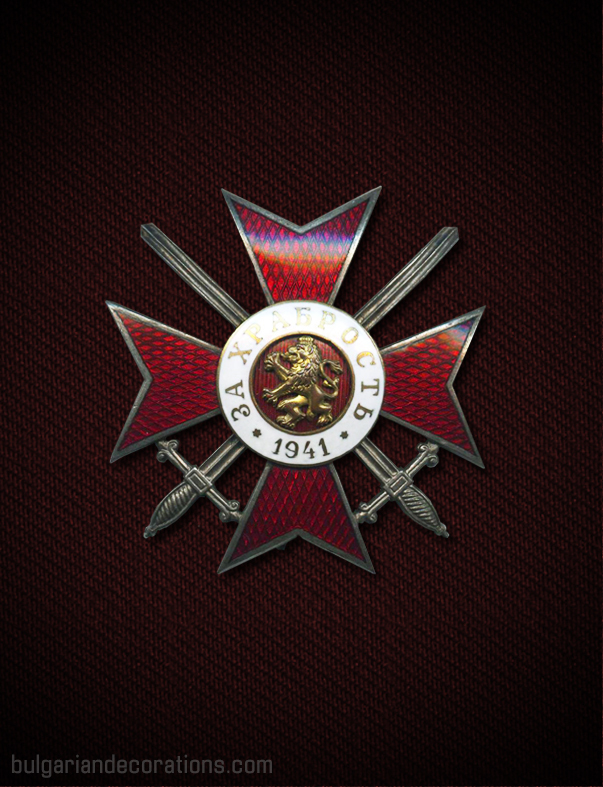 The organisation of the order is similar, yet different to the one of the Russian Imperial Order of St. George. This is due to the fact that the order statute of the Bulgarian order has been created using the guidelines, set in the statute of the Russian decoration. This has been intentionally done, one, among many other reasons, being the fairly recognisable and prestigious status of this particular Russian decoration within Europe and in Bulgaria itself. 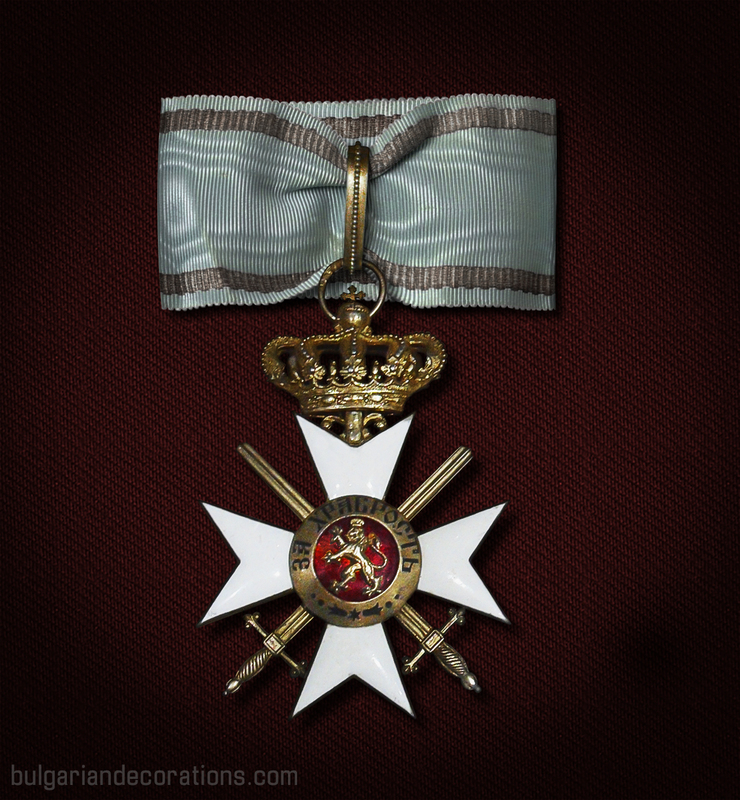 Throughout its existence, the stature of the Military Order “For Bravery has been modified and updated multiple times. 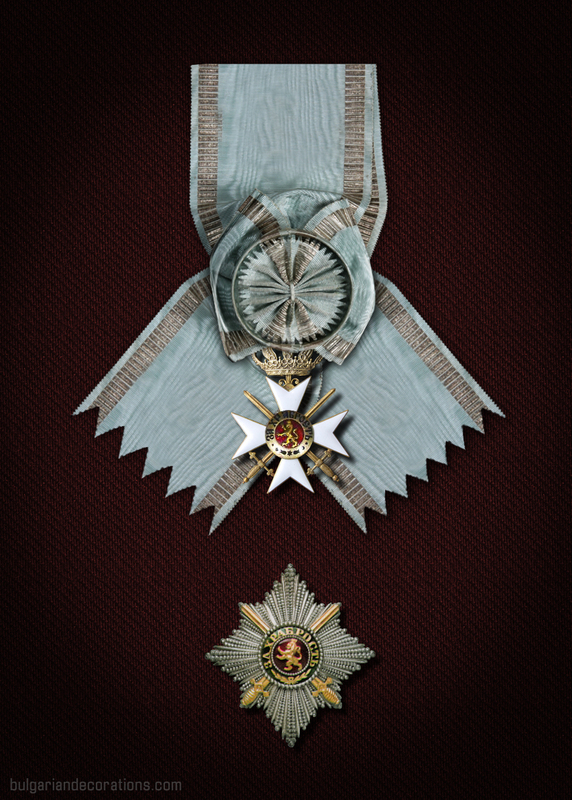 The first notable change was in 1886 when the Grand Cross class has been officially instituted by the division of the first class into two grades. 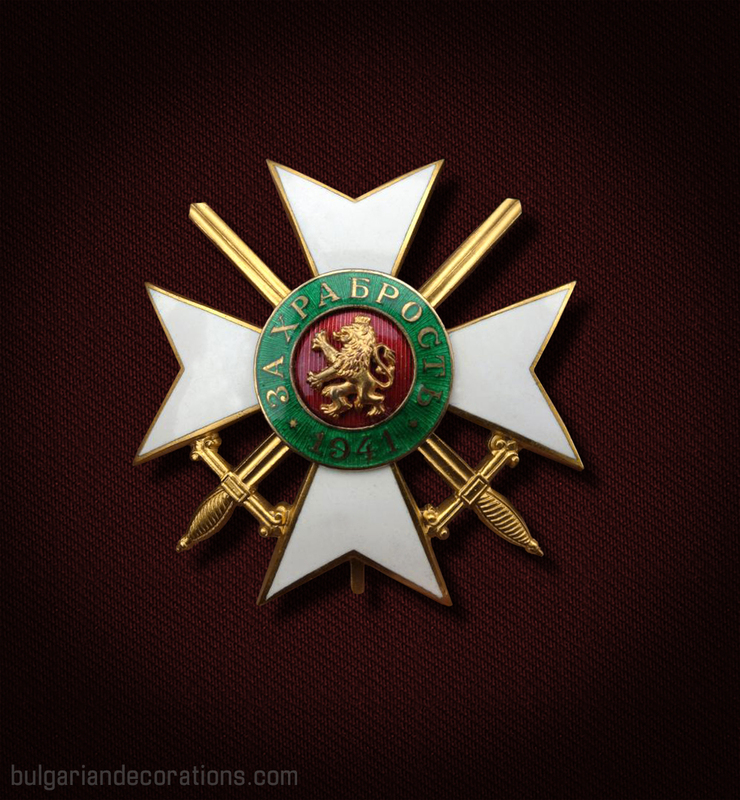 The newly introduced Grand Cross badge is a prerogative only of the Grand master of the order – the ruling Bulgarian monarch. This highest class is also known as 1st Class 1st Grade and is being worn on a wide order sash over the right shoulder and across the chest, along with its breast star on the left side. 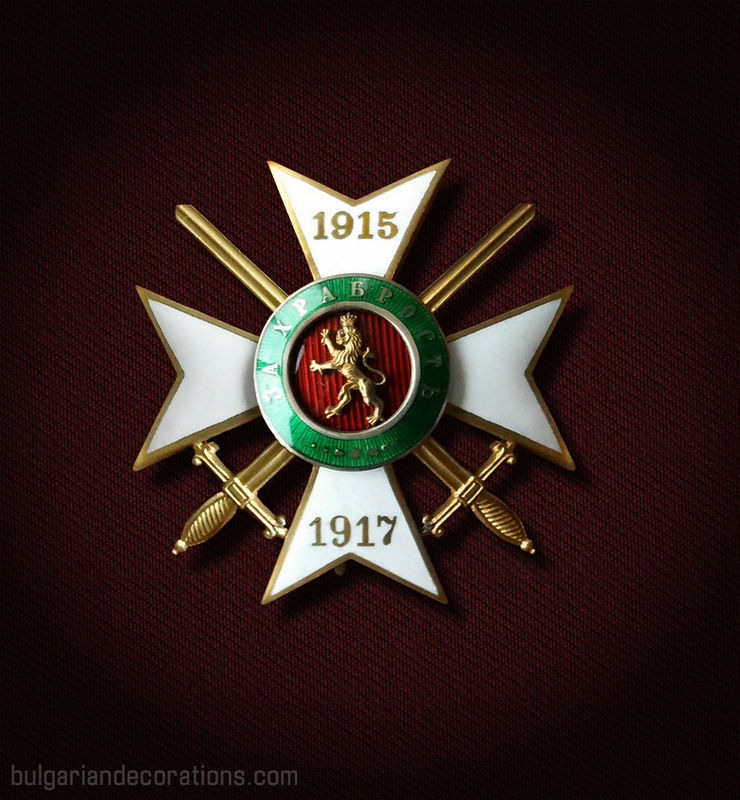 The history of the Grand cross insignia is not very clear even today. From the few historical artefacts on this subject, we can get the general picture but the important details are yet to be revealed. 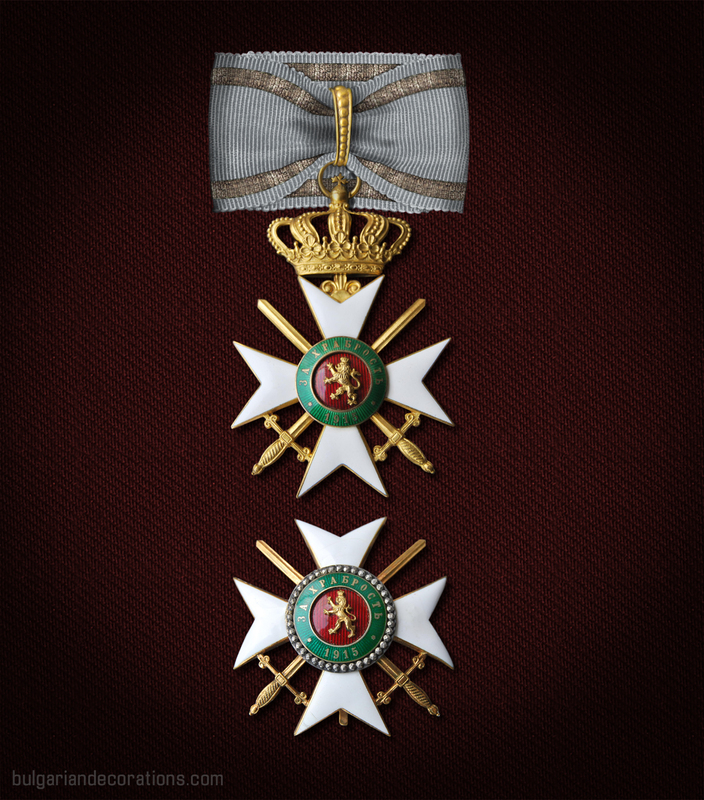 For example, we cannot say what the total number of people who have been decorated with this highest class was and even for those of whom we are certain, Prince Alexander I and King Ferdinand I, we know little in regard to how their actual badges looked like. 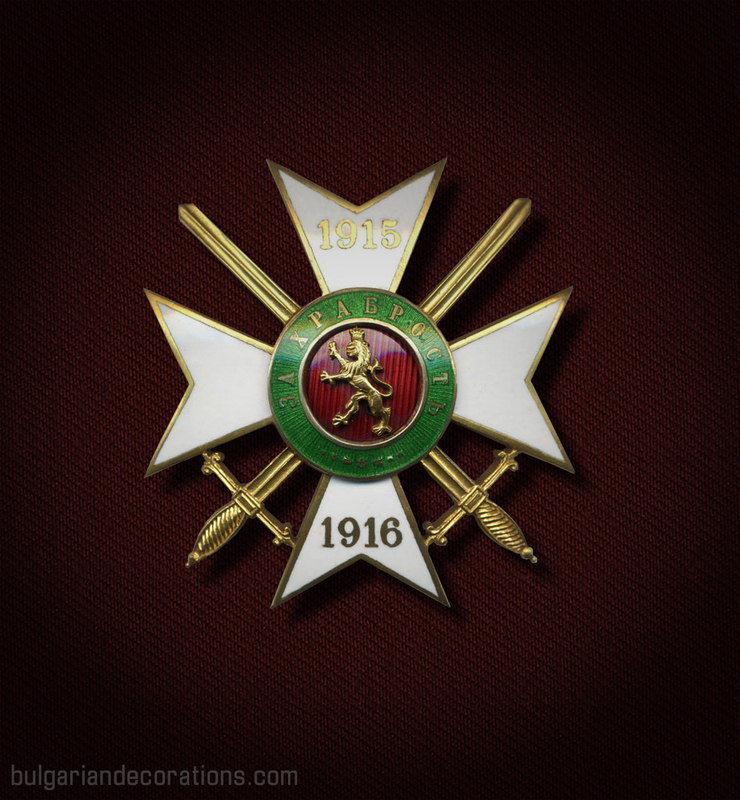 On the first picture above is shown a reconstruction of the Grand cross badge and the breast star which belonged to H.R.H Prince Alexander I. On a few photographs from 1886, He can be seen wearing the sash along with the rhomboid star. 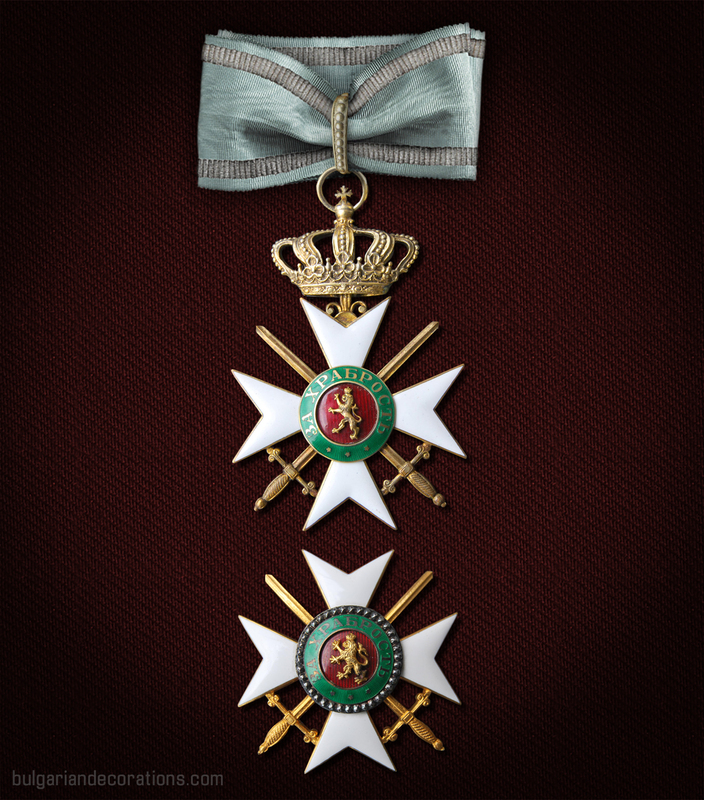 The second image represents a reconstruction of the Grand Cross insignia of H.R.H Prince (later H.M. King) Ferdinand I. 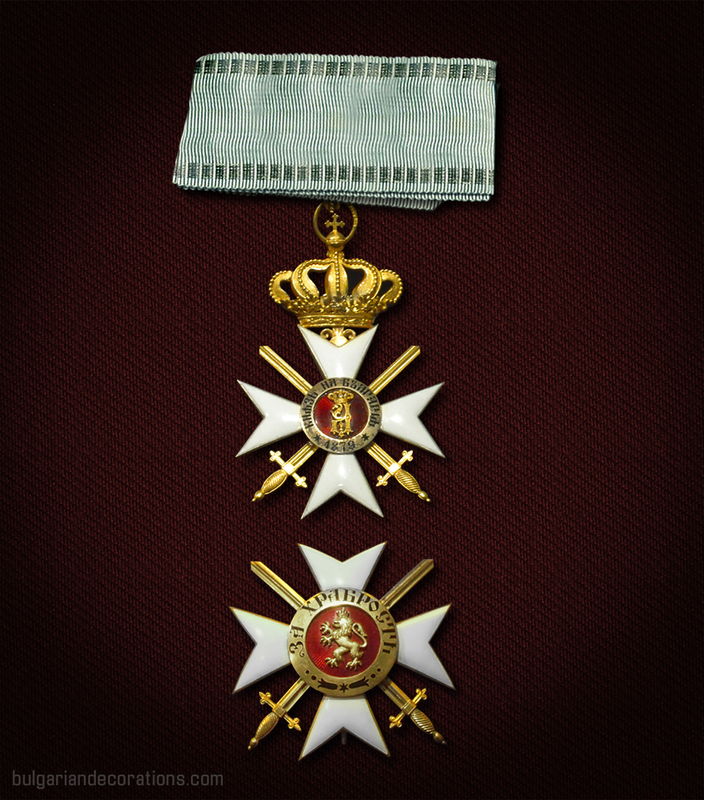 In the case with His decoration, the Grand Cross badge remains unconfirmed and we can only assume that the actual cross was a generic cross attached to the order sash and only later the Monarch has added skulls with crossed bones at the base of the cross swords. Similar is the case with His breast star insignia – at the beginning of His reign, the Prince is pictured with an eight-pointed silvery star, four of the points being shorter than the rest. This star had the familiar and slightly enlarged central medallion of the order but in this instance the outer ring was enamelled in green and the motto was written in gilded letters. Also the medallion had silver beads along its edge and crossed gilded swords running along the length of the star in saltire. 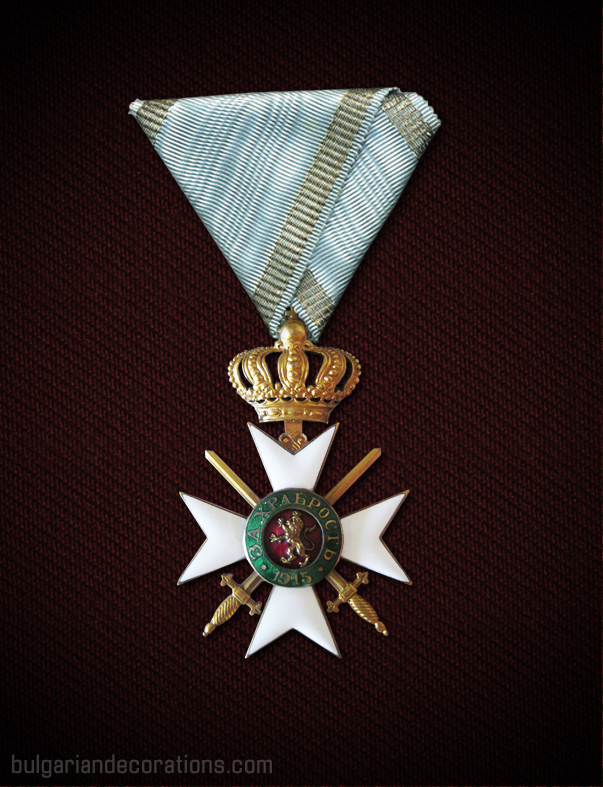 This type of breast star was soon substituted with a rhomboid silvery one, having the order’s badge mounted over the base, with skulls and crossed bones between the arms of the cross and no crossed swords. 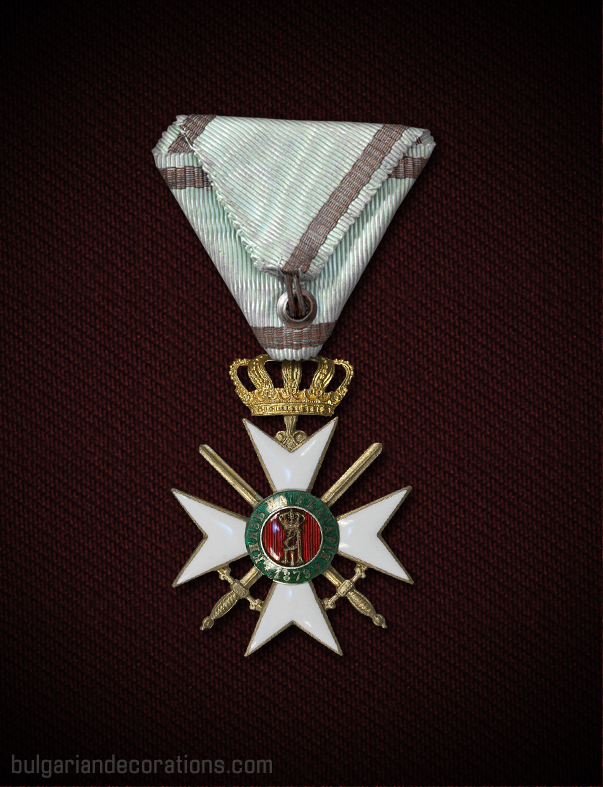 This type of the Grand Cross star is used by the King until His death in 1948. Official illustrations, issued by the Chancellery of Bulgarian Orders in late XIX century depict the Grand Cross star of the Military Order as an eight-point gilded base with superimposed the barge of the order, along with crossed swords and silver beads along the outer edge on the central medallion but without the crown suspension. There are no known issues of this type of star. 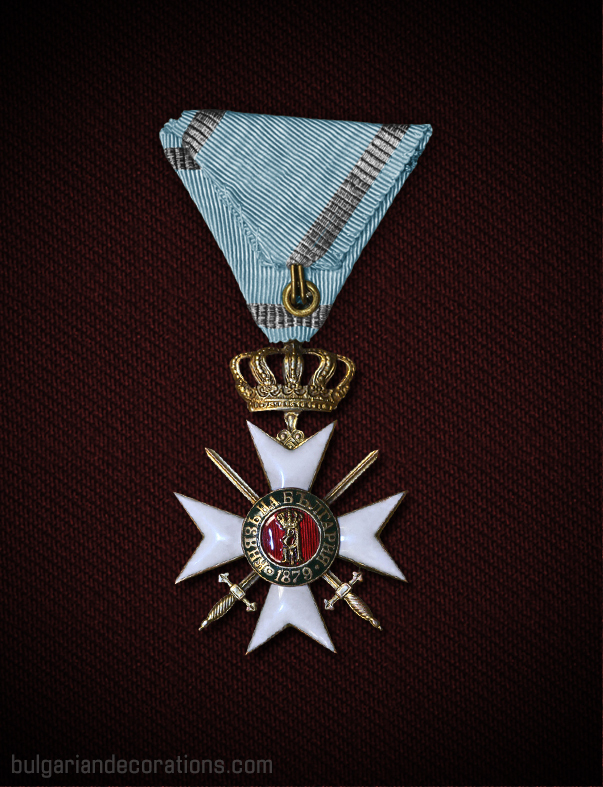 There’s no data of any Grand Cross insignia belonging to H.M. King Boris III even though he was entitled to it as a Grand master. 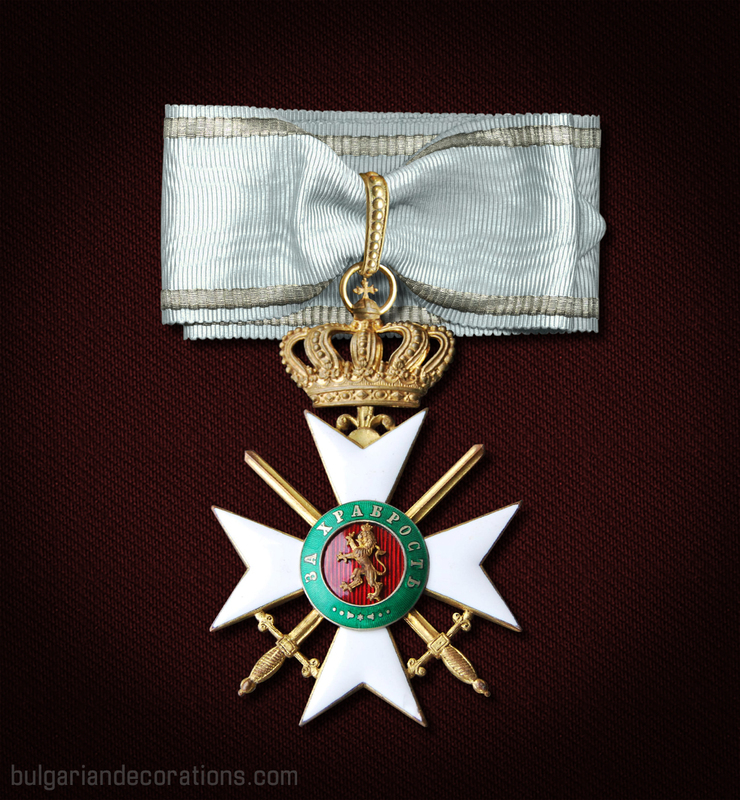 The First Class of the Military Order was the highest class until the introduction of the 1st class 1st grade in 1886. 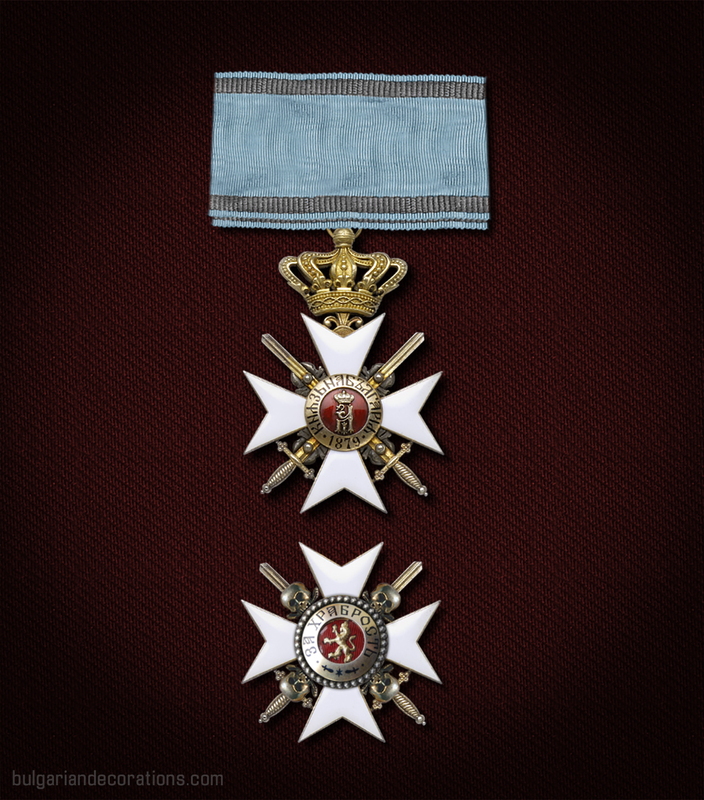 The introduction of the new, higher grade of the order meant that the old-style 1st class set had to be renamed to 1st class 2nd grade, in order to make the distinction between the two highest classes. Even so, throughout the history of the Order “For Bravery”, the 1st class 2nd grade set was simply referred to as ‘1st Class’. 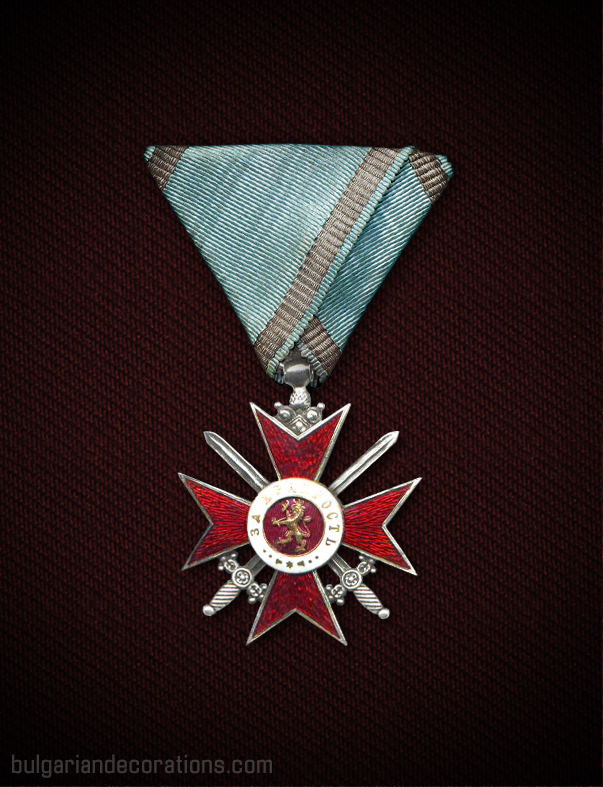 According to the order registers, by the beginning of the Second World war, only less than 30 individuals have been presented with this high military decoration, most of whom foreign nationals and only five Bulgarians – Prince Alexander I, Prince(King) Ferdinand I and the three regents - Stefan Stambolov, Giorgi Zhivkov and Colonel Sava Mutkurov. Apart from the individual decorations, the order statute makes it possible to decorate whole military units for their outstanding bravery and sacrifice. This is the case with the 3rd Radomirska Company of the Bulgarian Voluntary Corps during the Russo-Turkish war of 1877-1878. 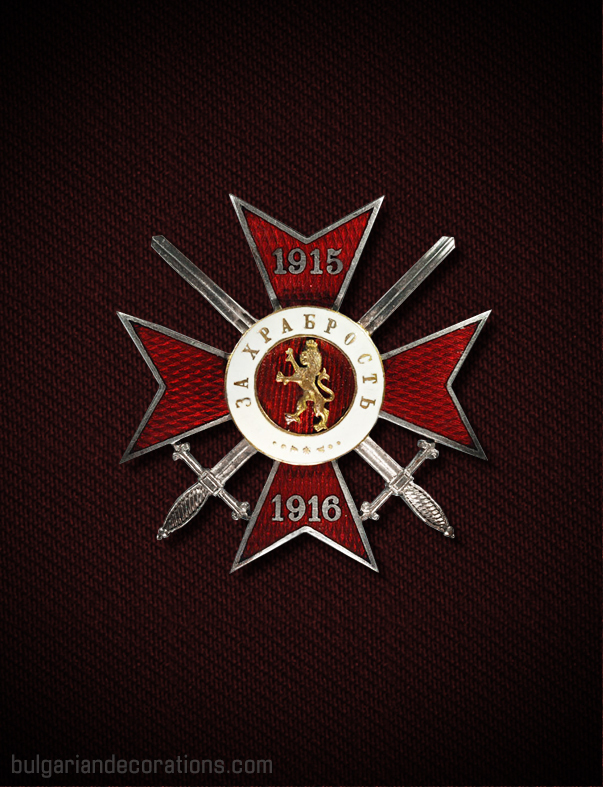 The special issue of the first class badge is imbued within the flag top of the military banner of the company. There are several known issues (or emissions) of the 1st Class set. The first general issue features a gilded outer ring of the central medallion, inscribed with black Old-Church-Slavonic font. There are at least two variations of this group, the minor differences being the slight variations of the crown suspension and the existence or lack of silvery beads around the edge of the central medallion of the breast star. Both the badge and breast star are similar in appearance and size (generally between 59 and 61 mm, depending on the issue). 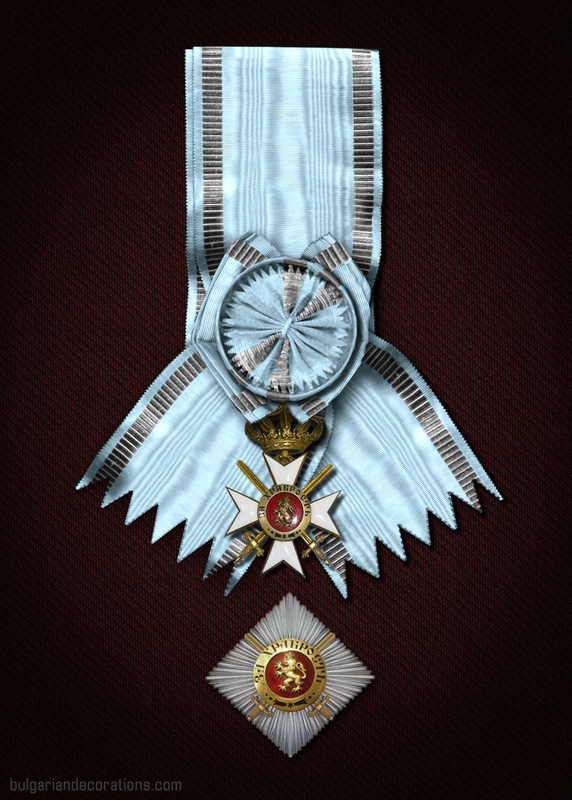 The 1st class badge was worn suspended from the sky-blue neck ribbon and its breast star – pinned on the left breast. Soon after the War with Serbia of 1885, a new design of the Military order takes over. Unlike the previous issue, the new one has a green enamelled outer ring and the lettering on it becomes golden (gilded). This new type is being used to decorate the three regents in 1887 for their zeal and dedication in keeping the social and political order within the country, following the deep political crisis after the abdication of Prince Alexander I. This issue has been labelled ‘seven dots’ issue, due to the seven decorative elements at the lower part of the obverse central medallion. 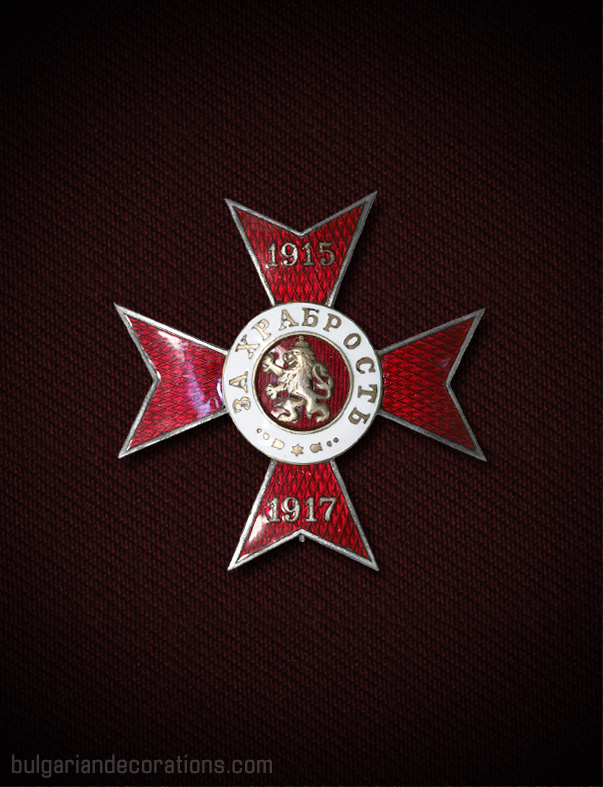 The ‘1915 issue’ has been introduced in 1916, following an order by the Headquarters of the Bulgarian military, which states that all Military orders “For Bravery” (including the soldiers’ crosses) awarded during the Great war, should bear the year 1915 (the year Bulgaria enters the war against the Triple Entente). Apart from the amended central medallion on the obverse, the badge design remains unchanged. A certain time after the end of the Great War, a new issue of the Military order is being issued. It’s almost the same as the previous ones, the only difference being the obverse medallion which has the motto “ЗА ХРАБРОСТЬ“ inscribed in a slightly enlarged font and the date has been substituted with three stars. There are special issues of the first class set which feature skulls in between the cross arms. Such samples have been displayed by Prince Alexander I and Prince/King Ferdinand I. During the Great war, the German Emperor has also been presented with the first class set with skulls. The second class of the Military order has been awarded to army generals only. The few exceptions which were made in 1885/1886 were due to the unusual conditions within the Bulgarian military at that time. According to the order registers, the total number of people decorated with this class by 1930 was less than 40, among these 15 were foreign nationals. 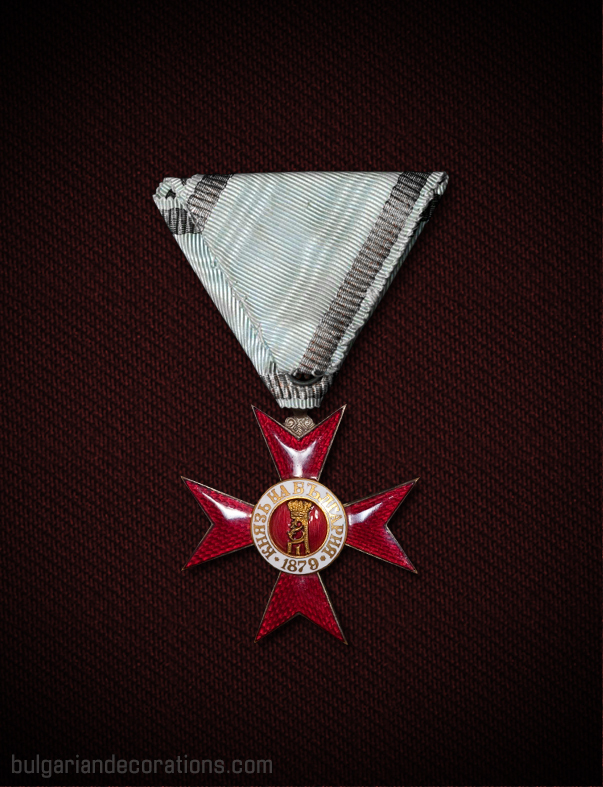 In this sense, the second class was practically the highest class which has been awarded to a professional Bulgarian army general or officer for his deeds in war, apart from General Mutkurov, who was decorated with the 1st Class 2nd Grade for his merits as regent during 1886-1887. 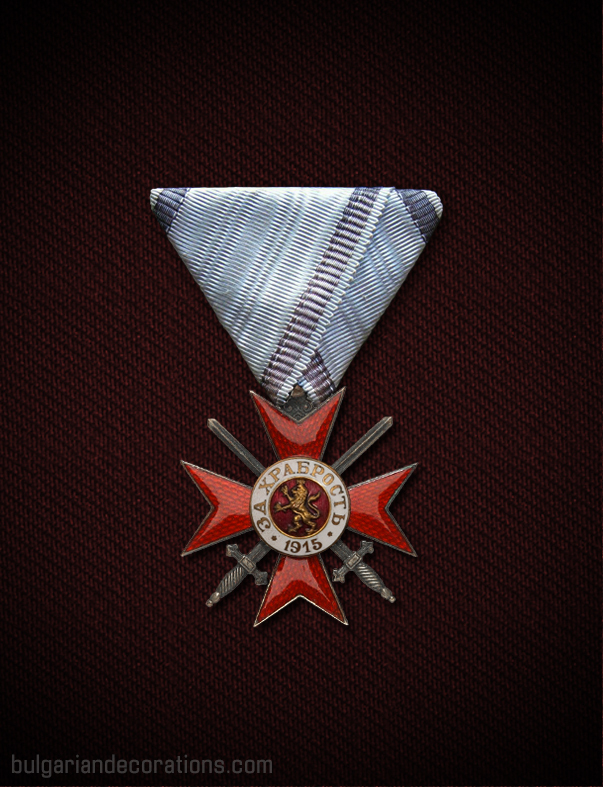 The badge 2nd class is similar in appearance to the 1st class 2nd grade badge but slightly smaller in size (55-56mm) and is awarded without any breast star. The so called issues are also similar – the examples with gilded outer ring of the Battenberg period, the ‘seven-dots’, ‘1915’ and ‘three stars’ (or ‘three dots’) emissions. The badge third class is dedicated to distinguishing senior army officers, and in very rare cases junior ones, for their outstanding military courage and valour. 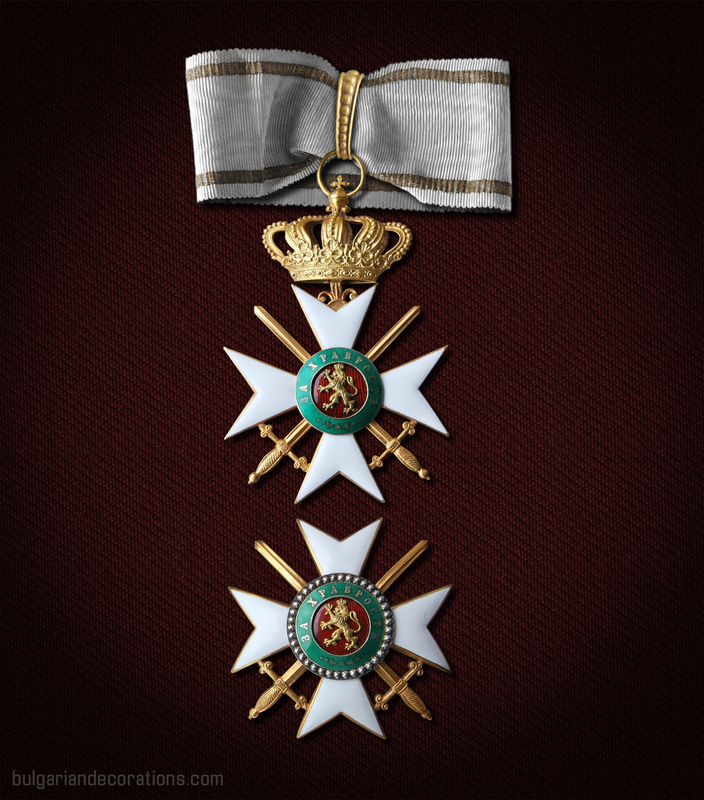 Throughout its history, the third class of the Military order has been awarded rarely. Prince Battenberg decorated only 12 Bulgarians in total for their merits in the wars of 1877-1878 and 1885. The third class badge represents a 38-39mm long white-enamelled gilded cross with the familiar green and red enamelled central medallion. The cross is suspended from a gilded Hessen crown which is attached to a folded in a triangular shape (or in some cases pentagonal shape, depending on the width of the ribbon) order ribbon. When the Bulgarian Kingdom entered a new war in 1915, the Order council and the Monarch tried to find a way of making the Military order more flexible and better suit the Military in the time of war. 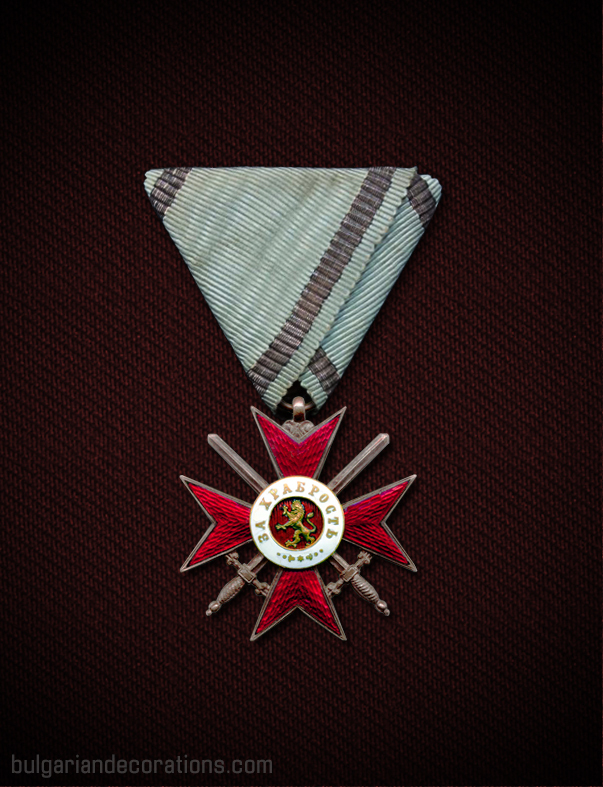 In early 1916, by a special instruction on behalf of the Bulgarian Army HQ, the current third and fourth classes of the Order “For Bravery” are being split into two grades each, similar to the 1st class. The familiar third class badge is renamed to Third class Second grade and remains unchanged in terms of appearance. The newly introduced Third class First grade represents a pin-back uni-face cross, 52mm in length, similar in design to the second grade, but has a smooth reverse, is not suspended from any ribbon or crown and is instead being worn pinned on the left breast. The so called emissions of the third class first grade are two – those of '1915' and '1941'. 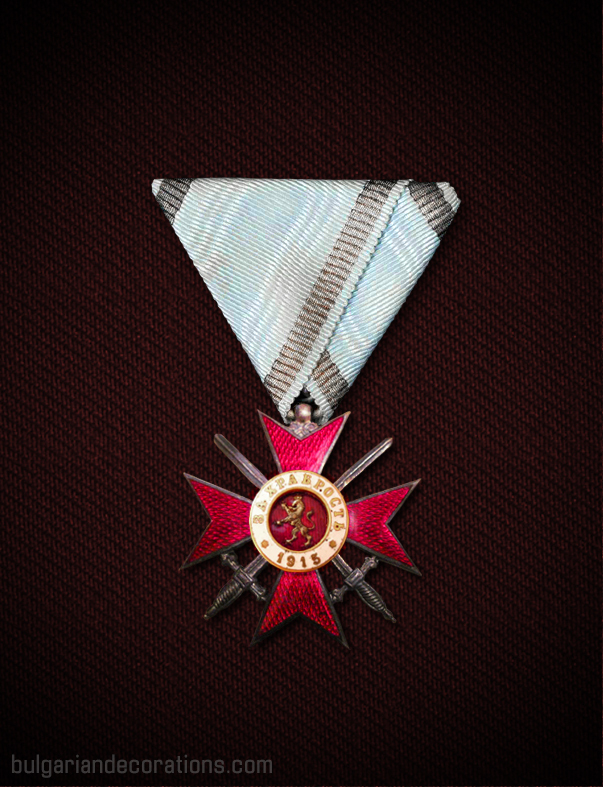 The ‘1915 emission’ is sub-divided into two more variations, depending on the year inscribed on the lower arm of the cross – either 1916 or 1917. The next and final emission bears the year 1941 which is inscribed on the lower part of the circular medallion, rather than on the upper arm of the cross, as in the previous emission. The second grade of the third class has more variations and models, compared to the first grade. The first general emission is the gilded outer ring emission with Slavonic letters, often being referred to as ‘seven-dots with Slavonic letters’ or simply ‘Battenberg emission’. This general type has many different examples and variations, some of which are unique. The next major issue is the so-called ‘seven-dots’ which in most cases refers to the examples which feature a green-enamelled outer ring and gilded ordinary letters. This type has been used for decorating the officers who took part in the Balkan wars of 1912-1913 and in the very beginning of the Great War. In 1916, the ‘1915 issue’ has been minted and introduced as the second grade of the third class. The only notable difference compared to the previous type was the introduction of the year 1915 in place of the former seven decorative elements at the bottom of the green-enamelled outer ring of the central medallion. 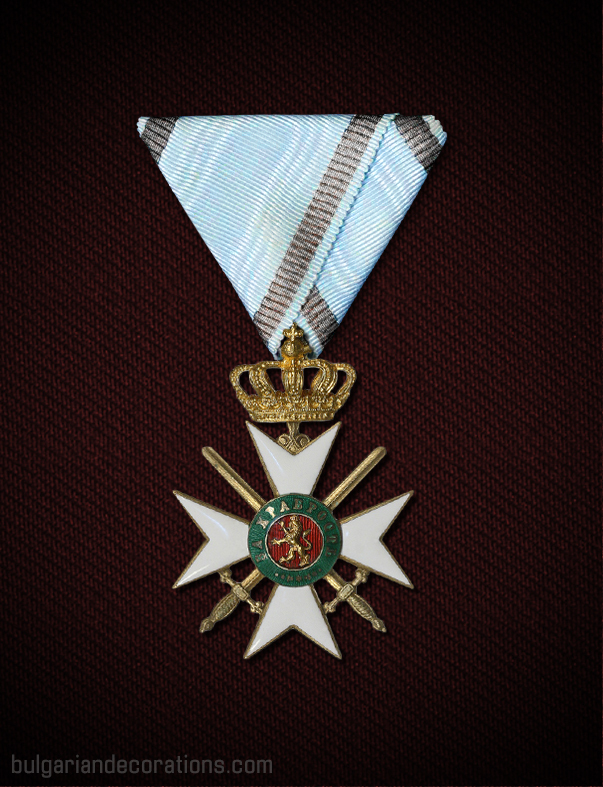 In addition, the majority of the orders of the '1915' edition have the crossed swords 'free-floating' between the arms, as opposed to the previous (and later) emissions where the sword handles are fused with the arms of the cross. Later types of the ‘1915 issue’ also feature a modified inscription on the reverse – the royal title of the founder of the order has been amended from “КНЯЗЬ НА БЪЛГАРIЯ” to “КНЯЗЬ НА БЪЛГАРИЯ”, in order to reflect the spelling changes of the Bulgarian language since the 1879. The same goes for the ‘1941 issue’ which is basically the same as the previous one, though with slightly more noticable edges of the cross and the amended year of the central medallion of the obverse – 1941, the year which Bulgaria has signed the Tripartite Pact. 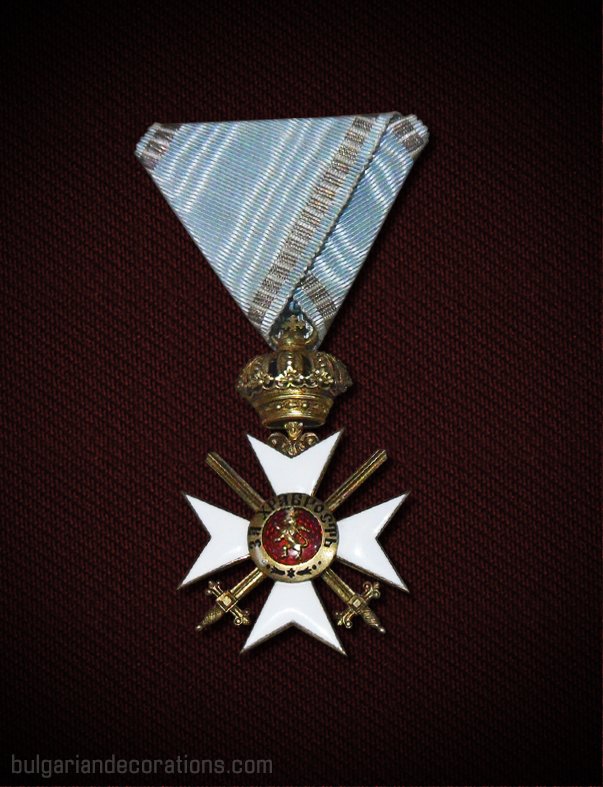 The fourth class of the Military Order is intended to be bestowed upon both senior and junior army officers for their deeds on the battlefield. 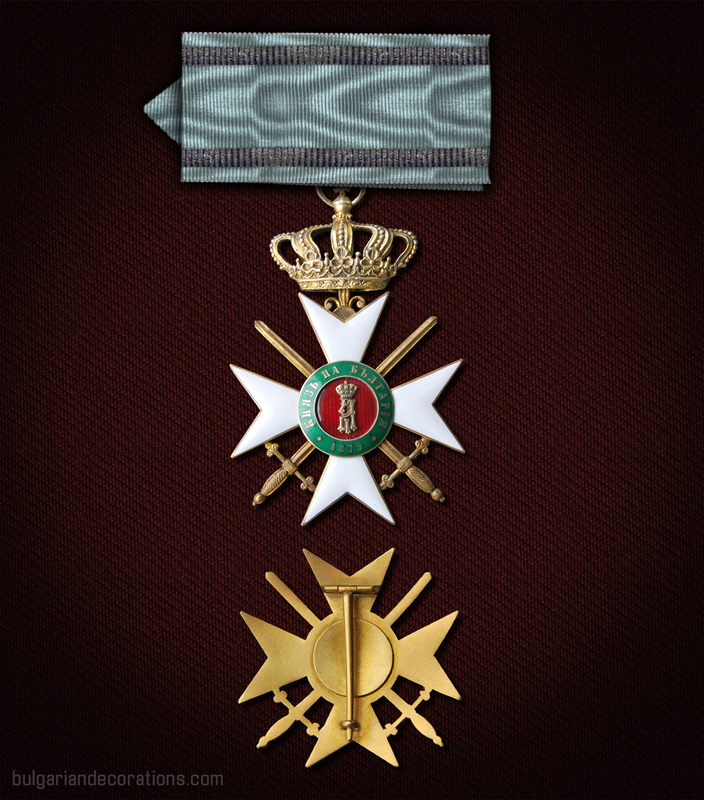 Throughout its history, the fourth class has been awarded to thousands of Bulgarian and foreign officers throughout the six wars in which the Bulgarian military has taken part. 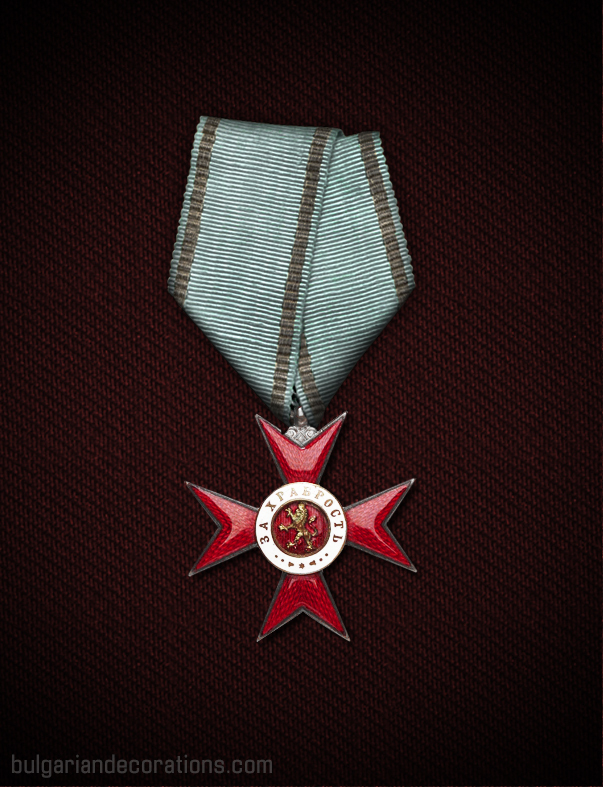 The fourth class badge represents a red-enamelled silvery cross, 39mm in length, with the outer circle of the central medallion enamelled in white. The cross is suspended from a triangular (in rare cases pentagonal or threaded-through) ribbon. Unlike the third class, there’s no crown suspension. 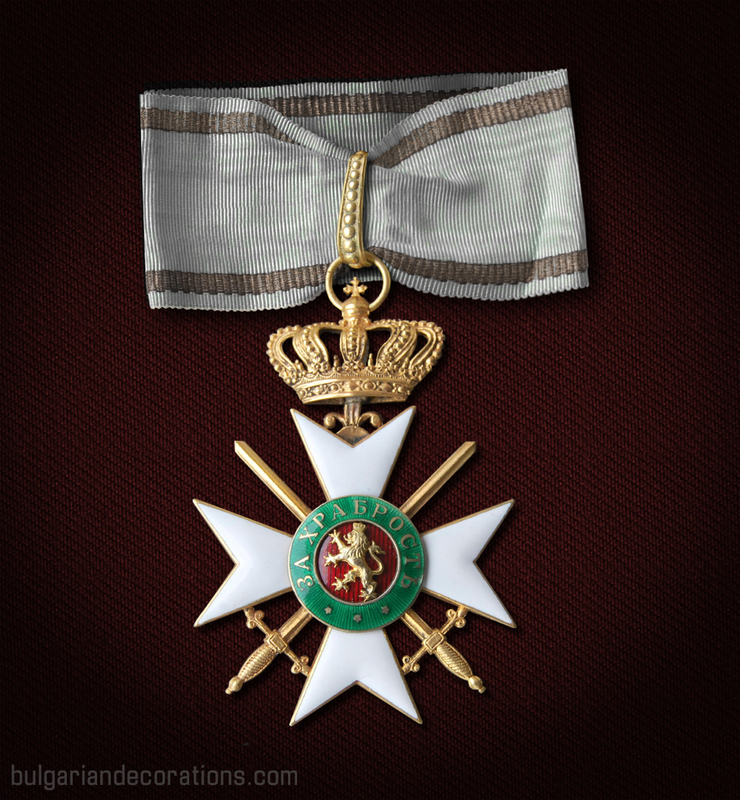 Only the fourth class of the Military Order can also be awarded without crossed swords (since 1884). These issues are extremely rare. They have been awarded to non-combatant officers like army doctors or bandmasters but always for their merits on the battlefield. Some sources suggest that Queen Eleonoire has also been decorated with the fourth class without swords for her decisive role during the evacuation of the field hospital at the end of the Second Balkan war. In 1916 the fourth class, similarly to the third class, has been divided into two grades. First grade represented a pin-back uni-face silvery badge with arms enamelled in red. Its size was approximately 50mm. The second grade of the fourth class represented the long-existent red-enamelled cross, suspended from a triangular ribbon. 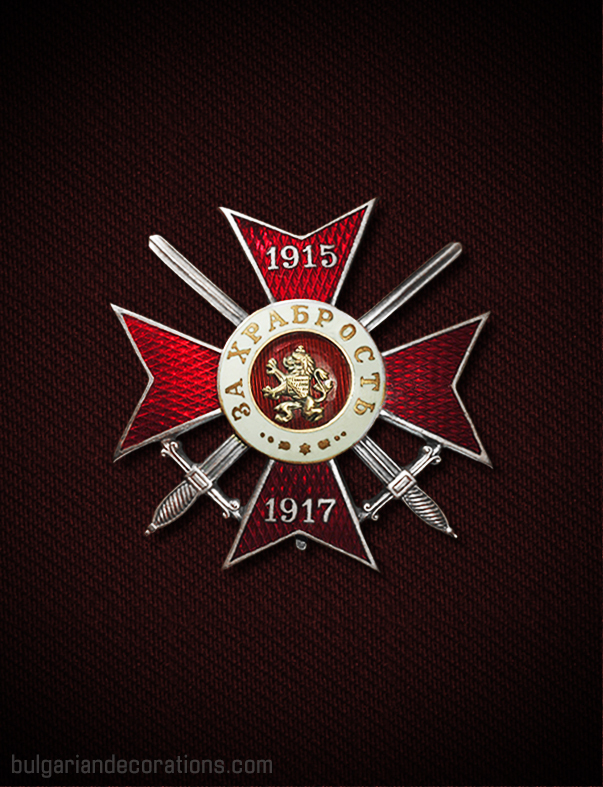 The newly introduced changes to the order also stated that all badges should bare the year 1915 (the year Bulgaria entered the Great War). This applies to all the classes of the ‘1915’ emission, including the fourth class. The first grade had ‘1915’ inscribed on the top arm of the cross, while on the lower one there was either ‘1916’ or ‘1917’ depending on the date of the sub-emission. 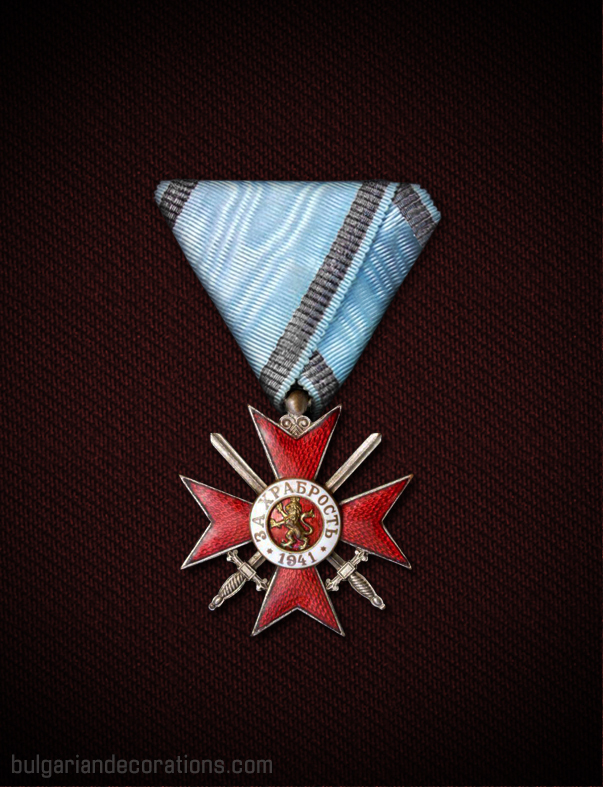 Since early 1917, the Fourth class First grade can also be awarded without crossed swords, similarly to the other grade of fourth class. The first ever issue of the IV class is made of solid silver and features a slightly different in style crossed swords and a more elaborate ear. 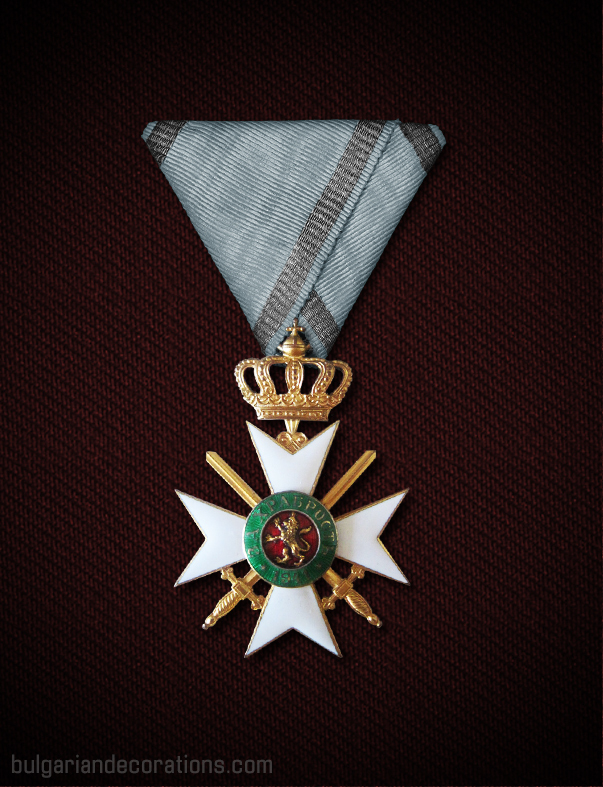 This type has been produced in limited numbers and was probably awarded by the founder of the order – HRH Prince Alexander I. This type is part of the so-called 'seven-dots’ master issue. It has multiple sub-types and variations. Among these, the most notable are: the issues with a wider outer ring of the central medallion; issues with a lily-shaped ear; and issues with decorative notches on the rims of the cross. The ‘seven-dots’ examples have been awarded since the establishment of the order, up until the introduction of the ‘1915’ emission in 1916. Next is the '1915' issue. As outlined above, this modification is mainly in the outer ring of the obverse central medallion - the introduction of the year 1915. The '1915' type is also wide-spread and there are multiple variations of the badge, depending on the manufacturers and year of production. Similarly to the others classes, the late ‘1915’ emissions of the Fourth class Second grade bear the updated inscription on the reverse - “КНЯЗЬ НА БЪЛГАРИЯ”, which swapped the outdated ‘I’ with the contemporary ‘И‘. Between the two World wars, there has been a very limited (in terms of numbers minted) emission, labelled ‘three-dots’ due to the three stars on the obverse of the badges. Only a tiny numbers of this type have been awarded and some authors completely omit or dismiss this variation as a possible trial emission. The last emission of the Military order during its royal period is the ‘1941’ emission. It features the year 1941 on the central medallion of the obverse for both grades of the fourth class.